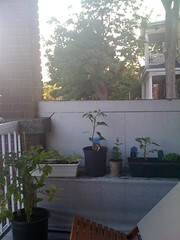 In an attempt to be a successful gardener in not one, but two countries, witness my city patio veg patch. I’ve planted a tomato plant (Pink Girl variety), a jalapeno, a green pepper, 4 lettuce plants, and a small herb garden with basil, oregano and mint (in its own pot so it doesn’t destroy its herby neighbours). There are several factors that are causing me concern around my little patio garden. First of all I have no idea what I planted. I arrived at the Loblaw’s garden centre 10 minutes before closing and the garden expert on staff litterally thrust plants in my general direction in order to get me out of there. I may have varieties that only thrive in sand or clay or who knows. And of course there are the regular concerns–are they getting enough sun? Are then getting enough water? Enough TLC? I have control over a few of those items and will do my best to give them what they need to thrive. I suppose that by the end of the summer I may be producing vegetables in huge quantities on both sides of the border! I may need to open my own produce stand right here in New Edinburgh! Hmm… I guess I’ll cross that bridge when I come to it and in the meantime try to remember to water the poor little guys. When we started clearing the ground to create our garden area, one of the first orders of business was to get rid of all the bramble, raspberry bushes and other related weeds from the paddock. Andrew took to this like a duck to water and even sharpened the appropriate bladed instruments to accomplish the task. It did feel like a great accomplishment to clear that land and feel like we were giving it new life. And new life is exactly what has sprung up: phlox by the dozens! 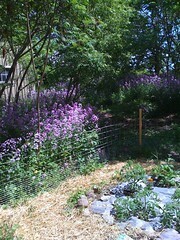 This crop of phlox is a gorgeous lilac, lavender and white and simply covers the ground, standing to about 3 feet high. This certainly gives us pause in terms of re-clearing the land around the garden, which was one of our goals. We will have to reevaluate after the phlox has lived out its life. In the meantime we will enjoy this blanket of field flowers and feel happy that we helped give them what they needed to flourish!